Filet mignon is inarguably elegant. It's one of those special meals, like pan-seared scallops, that's ready in a flash but always feels special. 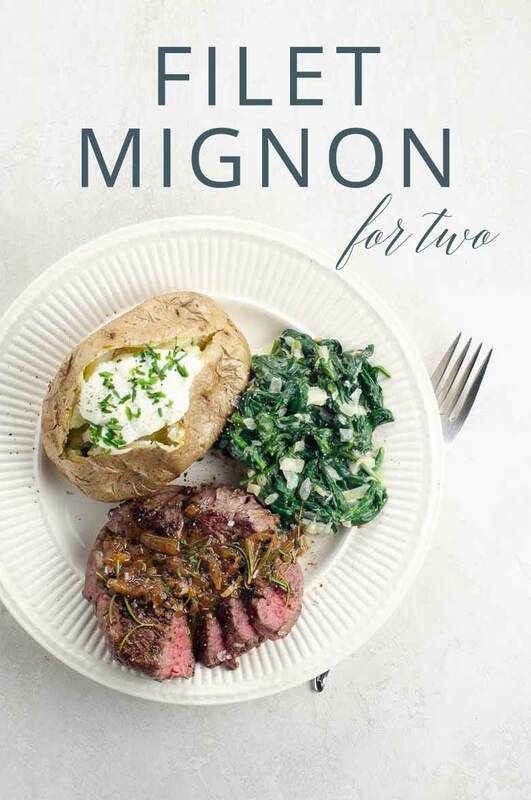 Our filet mignon recipe with easy pan sauce for two makes a great date night meal. 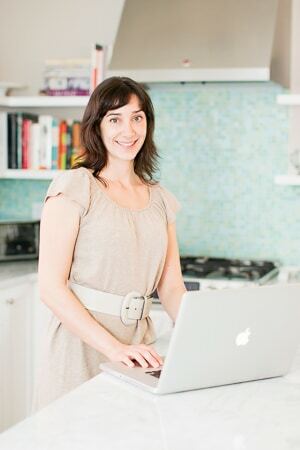 (Bonus: you can double it easily for a small dinner party or special family dinner.) 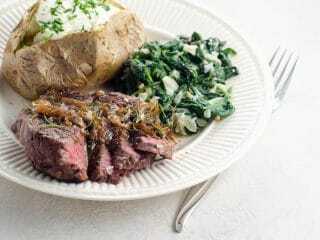 We love it with creamed spinach and either perfect baked potatoes or small-batch Yukon Gold mashed potatoes. Or swap out the starch for low-carb mashed cauliflower with smoked gouda. Cook filet mignon to 125°F and let it rest while you make the pan sauce to ensure perfect doneness. Filet mignon is a steak cut from the end of the beef tenderloin. As the name suggests, it is a tender and delicate cut of beef, largely due to the fact that it comes from a non-weight-bearing area of the cow. “Mignon” means cute or little and delicate in French. The price of filet mignon varies by region and by quality. But in general, since the filet is small and prized, it can be quite expensive. We strongly prefer grass-fed and grass-finished beef for its environmental impact, taste, and nutritional profile, which can add to the cost. 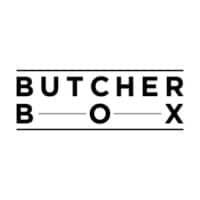 For the past year or so we’ve been getting meat delivered by ButcherBox, and we love it. It’s of wonderful quality and the cost is remarkably low. You can find complete nutrition information for this recipe at the bottom of the post. In general, grass-fed beef has a pretty strong nutritional profile. It’s high in protein of course, with a favorable ratio of Omega-3 to Omega-6 fatty acids, higher levels of antioxidants compared to grain-fed beef, and generally low hormone and antibiotic use. Pat filets dry with paper towels and season generously with salt and pepper. Protip: You do NOT need to bring your steak to room temperature before cooking “for even cooking.” This is kitchen mythology. Ignore it. Set a 12-inch cast iron pan over high heat on the stovetop, and leave it alone for five minutes or so to get nice and hot. Swirl (or spread with a spatula) a very thin coating of oil into the pan. About a teaspoon will do for well-seasoned cast iron. Use a neutral-tasting oil with a very high smoke point. We like to use refined organic safflower oil, which has among the highest smoke points. Add filets to the pan and cook undisturbed for about 3 minutes on the first side, until a nice brown crust forms. Flip once and brown on the underside, about 2 minutes. If your filet is thick, you can also brown the edges if you like. To be honest we don’t always do this. Transfer the whole skillet to the center of a 400°F oven and cook until an instant read thermometer reaches 125°F (or juuuust shy of that temperature) when inserted into the center. The meat will continue to cook after you pull it out of the oven, so this method will yield perfect, true medium-rare filet. See the recipe below for more detailed instructions. 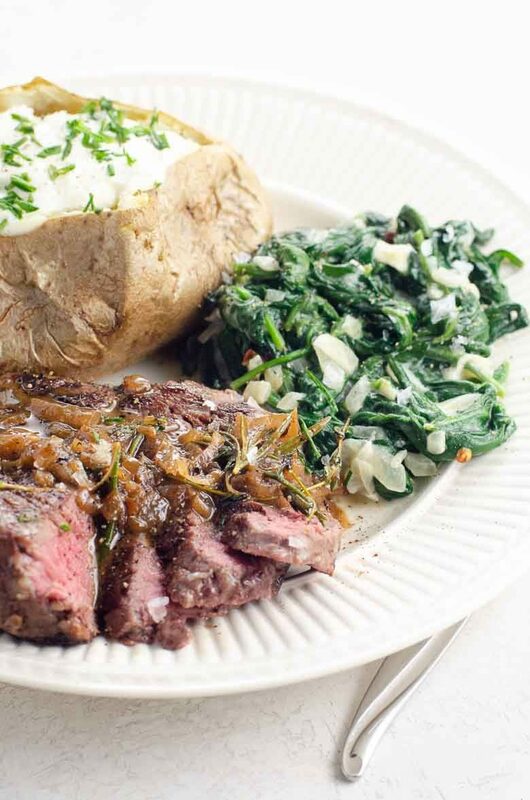 Filet is tender, delicate, and low in fat, and it’s really enhanced by our simple shallot herb pan sauce. The filet needs to rest for 5 to 10 minutes after cooking, as all steak should do in order for the internal temperature to settle and the fibers to relax enough to absorb all the delicious juices. This is the perfect window of time to make a simple sauce with a minced shallot, a few sprigs of rosemary and thyme, a splash of wine or stock, a dollop of Dijon mustard, and a swirl of butter. It couldn’t be easier. Can you reverse sear filet mignon? Just because you can reverse sear filet mignon does not, in our minds, mean that you should. Here's our reasoning. First, a major draw of filet mignon is its ability to shine bright with quick, no-fuss methods. Reverse searing takes a meal out of breezy, quick territory and into something a bit more time- and method-intensive. Since filet is so lean and tender to begin with, it's best served rare to medium rare, which is easy to achieve with a regular sear plus a quick stint in a hot oven, and without fuss. Reverse searing is best used when your cut of meat is at least 1 1/2 to 2 inches thick. Some filets are cut this thick, but some great filets aren’t. 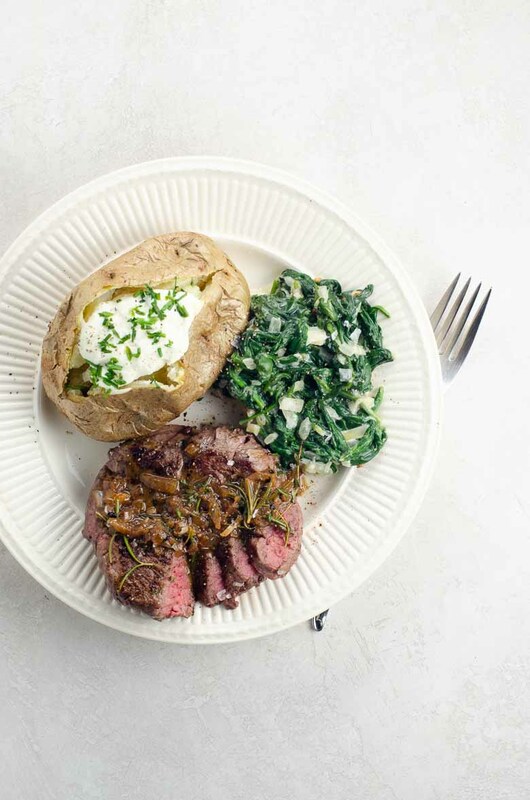 Finally, while filet is tasty on its own, its delicate flavor benefits from a little enhancement, like the simple pan sauce in our recipe below. Regular stovetop searing produces slightly better sucs (a.k.a. browned bits at the bottom of the pan), and better sucs yield better pan sauce. Pat filets dry with paper towels and season with salt and pepper. Heat a 12-inch cast iron pan over high heat until very hot. Carefully pour in oil and coat bottom of pan by swirling or spreading with a spatula. Place filets in pan and cook undisturbed for three minutes to sear. Flip once and cook two minutes more. Transfer filets to a cutting board to rest while you make the pan sauce. 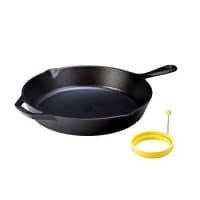 If pan contains any cooking oil, pour it off, but it probably won't. Back on the stovetop, add 1 tablespoon butter to hot pan and carefully swirl to melt. 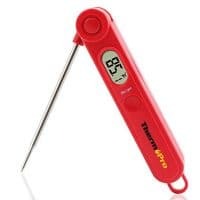 (You can be slow to turn the heat on under the burner, since the pan will be very hot. When you do — sometime after you add the shallot and herbs — turn it to medium.) Add shallot, rosemary, and thyme and cook, stirring frequently, until shallot softens, about two minutes. Add wine and mustard and stir to incorporate any browned bits on the bottom of the pan. Simmer for 2 to 3 minutes, until liquid is reduced by about half. Off the heat, swirl in remaining butter, along with any juices that have accumulated while the meat rests. Taste for salt and pepper. Serve filets whole or sliced, as you like, with pan sauce spooned overtop. You can leave herbs in the pan or, if you like, pick off a few of the rosemary and thyme leaves and serve with the sauce.